Cardiff Blues have appointed ex-New Zealand number eight Xavier Rush as their new defence coach on a two-year deal. The 34-year-old back-rower has retired from playing after suffering a neck injury towards the end of last season. 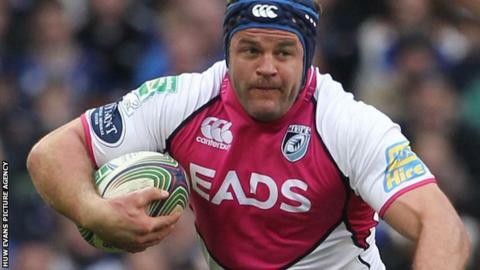 Rush has joined the coaching staff of new director of rugby Phil Davies, who was appointed in May. Ex interim coach Gareth Baber will also continue with the Blues however Justin Burnell has left the region. Although disappointed to be giving up his playing career, Rush said he was looking forward to his new role and working under Phil Davies. "It's going to take some adjusting," said Rush of his new role. "You wouldn't be human if you weren't a bit apprehensive about the challenge ahead. "But thankfully I've been able to work closely with Phil for a wee while and get some foundations and systems in place so we can move forward. "He's an experienced coach in his own right and just in terms of the chats we've been having I'm sure I'm going to learn a lot." Rush joined the Blues from Auckland Blues in 2005 and scored 22 tries in 153 appearances for the region. He captained the region for two seasons from 2006 before handing the reins to countryman Paul Tito. Rush agreed to join Ulster on a two-year deal in February 2010 but stayed at the Blues following a change of heart. He won eight All Black caps and captained Auckland Blues to the Super 12 title in 2003. Rush has been forced to retire on medical advice after he sustained a neck injury during the Blues' Heineken Cup defeat against Leinster last season. "It's disappointing not to go out on your own terms," said Rush. "[Being] told you can't play again is a hard thing to hear. "But I'm not seeing it as a sad occasion. I look back and I've had 16 years of professional rugby and I feel blessed to have had so many good memories. "There's a lot of memories here with the Blues and also a lot of memories back with the Auckland Blues." The Blues also confirmed forwards coach Burnell, who was interim coach alongside Baber last season, has left the region with immediate effect to pursue alternative coaching roles. "We would like to thank him for the commitment that he has shown over the years and we wish him the very best for the future," said Blues chief executive Richard Holland.